Hong Kong (CNN) -- A zoo in China has angered visitors by trying to pass off a hairy dog as a lion, Chinese state media reported. A visitor, surnamed Liu, told the state-run Beijing Youth Daily she discovered the fraud when visiting a zoo in a park in Louhe, a city in the central province of Henan, with her son. As they approached the cage marked "African lion," they were shocked to hear the beast inside emit a bark. 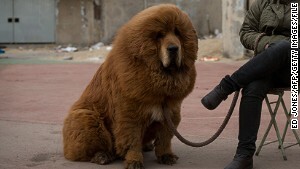 It was a Tibetan mastiff -- a large, hairy breed of dog. "The zoo is absolutely trying to cheat us," Liu said. "They are trying to disguise dogs as lions." A Tibetan mastiff (not a lion). Other species in the park were similarly mislabeled, the newspaper reported, with another dog in the wolf cage, and a white fox on display in the leopard enclosure. The head of the park's animal department, Liu Suya, told CNN that the animals had been substituted for various reasons, and would be back in their rightful place soon. The lion and leopard had both been removed for breeding, she said, with the Tibetan mastiff placed in the lion's cage temporarily "due to safety concerns." The zoo is absolutely trying to cheat us. They are trying to disguise dogs as lions. Similarly, the dog had been placed in the wolf enclosure to breed a hybrid wolf-dog, she said. "We're not doing it out of shortage of funds," she said. The substitute lion has drawn ridicule on Chinese social media, with one commenter describing the situation as "absurd." "If this works why would people even bother to go to the zoo!" wrote Guohebaxiaoma. "Children will cry out 'look a lion came out!' at the sight of Tibetan Mastiff or 'look it's a rat!' seeing snake on the street...This is totally absurd!" Yidongdexulaoshi said: "This time you're lucky. Because perhaps next time you will find that all the animals in the zoo are played by the faculty. LOL." "It's way too ironic. Why doesn't the zoo simply just put the zookeeper in a cage with the sign "Gorilla" on its gate," Lanseyapingningliuxunqing added.